This end times prophecy deception study will focus on the illogical teachings about the 70th Week of Daniel. Today’s Pastors have thrown logic out the window. They teach that only 483 years of God’s 490 year prophecy have been fulfilled; that there is a 1,986+ year time GAP; and then an end times 7 year tribulation, which finally fulfills the prophecy. So that means that so far it has taken God 2,476 years to fulfill His own 490 year prophecy. What kind of God are these Pastors teaching us about? Only a weak god couldn’t fulfill his own prophecy on schedule. And logic tells us that if a 490 year prophecy isn’t fulfilled in 490 years, then the prophecy is invalid. Of course, the Most High God is not a God of confusion, and He fulfilled His prophecy on time. The 70 Weeks of Daniel study invalidated the foundation for a future 7-year period, as it proves that the covenant is from Jesus Christ, not an end times Antichrist. To see how illogical it is to insert a 1,986+ year time GAP into a 490 year prophecy, consider the following. The 70th Week of Daniel prophecy is about the Jews, not the end of the world. When you read the ninth chapter of Daniel, it starts with Daniel most earnestly praying with an attitude of humbleness before the Lord. He acknowledges/confesses the sin and apostasy of his people. He professed that God is righteous and just in His dealing out of punishment. And he prayed to God to restore his people (the Jews), as their 70 year captivity in Babylon was nearly over. While in captivity, a remnant of Jews stayed true to God, but the majority did not repent of their ways. Daniel was interceding, asking God to forgive them and to give them another chance to return to Jerusalem and reconcile with Him. He was not praying for revelation about the end times. The context of the 70 weeks of Daniel prophecy is all about the Jews and their release from Babylonian captivity. God was giving them one last chance to repent, to reconcile, and to prepare for their coming Messiah; before He removes the kingdom and blessings from them. It’s not about the end-times, so end-times prophecy should NOT be applied to it. It doesn’t make sense to apply the 70th week of Daniel prophecy to everyone in the world. The angel Gabriel said that the prophecy is only about the Jews being released from captivity, rebuilding of the temple in Jerusalem, and preparing for their Messiah. The 70 weeks were fulfilled from 457 B.C. to 34 A.D., so it has nothing to do with an end-times antichrist who seeks to control the whole world. The prophecy was only for Daniel’s people, the Jews; not to Gentiles or other nations. It’s a 490 year prophecy, not a (483 + 1,986 + 7) year prophecy. Of course the answer is 490 years, otherwise it’s not a 490 year prophecy. And if it wasn’t fulfilled in 490 years, then it invalid. Against all logic, today’s teachers say that God only fulfilled 483 years of His prophecy, and that there is a 1,986+ year time GAP before the final 7 years will be fulfilled, as the end times 7-year tribulation period. There has never been a precedent where God gave a timeline and then didn’t meet it in the time allotted. All biblical references to time are consecutive: 40 days and 40 nights (see Genesis 7:4), 400 years in Egypt (see Genesis 15:13), 70 years of captivity (see Daniel 9:2), etc. Logic demands that we look to see how God fulfilled the prophecy in the allotted time. Logic requires that the 70th week follow immediately after the 69th week. If it doesn’t, then how can it possibly be called the 70th week! Today’s teachers say that after the 69th week, the prophetic clock stopped, and that it won’t start ticking again until the end times 70th Week of Daniel, the 7-year tribulation period, begins. The enormous problem with that logic is that there is no gap mentioned, referred to, implied, or remotely hinted at, anywhere in the prophecy. They say that the events of the last 7 years of the 490 year prophecy were not fulfilled, therefore they speculate that it must be in the future. Since logic requires that “seventy weeks” refers to one consecutive block of time (seventy straight sequential weeks), we have to search the scriptures and refer to historical texts, to see how God fulfilled the prophecy in the allotted time. Many of today’s teachers says that Jesus was killed immediately after the 69th week, and that the 70th week never started. Ask yourself, how long was Jesus ministry? Was it not 3 ½ years, which was confirmed by the Gospel of John, as Jesus went to Passover 4 times, the last time to die. AFTER the 69th week, Jesus was anointed at His baptism, and then He proclaimed Himself as the Jews Messiah in the temple when He read from the book of Isaiah. Then Jesus ministered for 3 ½ years. His death occurred halfway through the 7 year period, fulfilling Daniel 9:27, which says that in the midst of the seven years, the sacrifices would end. Jesus blood sacrifice as the spotless Lamb of God fulfilled the Law, terminating the Sinai Covenant, causing the temple curtain to be torn in two, and ending the need for temple sacrifices. During the last half of the 70th week of Daniel, the disciples preached the Gospel to the Jews. Jesus and His disciples primarily ministered to the House of Israel for 3.5 years, as most of their time was spent in Galilee, not Jerusalem. After His death, Jesus disciples primarily ministered in Jerusalem to the House of Judah for 3.5 years. The 7 year period ended when Stephen preached the Gospel to the Jewish leaders and held them accountable for their promised Messiah’s death. The Jews leaders responded by stoning Stephen to death, fulfilling Jesus prophecy in Matthew 23:34-35. Then Paul was called to be the Apostle to the nations (Gentiles), and Philip was told to preach to the nations. This fulfilled Isaiah’s prophecy that the light of Jesus would shine and salvation would be offered to all of the nations of the earth. As punishment for the Jews killing Jesus prophets, He told the Jews that all the righteous blood of the prophets would come upon their generation. This was fulfilled in 70 A.D. when the people of Prince Titus, the Roman army, caused 1.1 million Jews to die. Does it make sense to mention the death of Jesus and the end times arrival of the Antichrist in the same verse? Verse 26 mentions the Messiah who will be killed and the prince who is to come. Today’s Pastors say that the “prince” is an end times Antichrist. Implying that the death of Jesus Christ and the end times arrival of the antichrist are in the same verse is not logical. Mentioning the death of Jesus Christ and the coming prince (Titus) who would desolate those who had Jesus crucified, makes perfect sense. The 70th Week of Daniel prophecy doesn’t mention the building of a 3rd temple. Many Pastors teach that an end-times Antichrist is going to desecrate a 3rd temple. The 70 Weeks of Daniel prophecy describes the rebuilding of the 2nd temple, but it doesn’t mention the building of a 3rd temple. Implying that the prophecy speaks about an end times Antichrist in a 3rd temple is illogical. Pastors use 2 Thes. 2:3-4 to justify the need for a 3rd temple, but the Antichrist In The Temple Deception study reveals that it is referring to the spiritual temple that is made up of followers of Christ, the Christian Church; not a physical temple. Does it mention a 2,000 year gap in between week 69 and week 70? Does it use the word “Antichrist”? Does it specify that an Antichrist will make a peace accord with Israel? Does it speak of an end times 3rd temple being rebuilt? Did the passage mention an Antichrist who will proclaim that he is god? Does it use the word “tribulation”? Did the passage mention the rapture of the Church? So why do teachers incorrectly separate the last 7 years away from the first 483? Because they don’t understand that it was completely fulfilled, thus they speculate that it must be future. And because Satan has deceived people, so that they don’t understand the signs of Jesus second coming, much like the Jews did not realize the time of Jesus first coming. Because the 70th week of Daniel has been fulfilled, the foundation for the concepts of the 7-year tribulation with an Antichrist entering a rebuilt Jewish temple, are invalidated! that leaves most Christians woefully deceived about what happens next in end times prophecy, and it leaves them unprepared to face the beast system as it moves the world into their New World Order, where everyone will be made to kneel and worship the beast… or die. The covenant in Daniel 9:27 is from Jesus Christ, not an end times Antichrist. Today’s Pastors say that the covenant is from an end times Antichrist, so it must be future. But the covenant was from Jesus Christ and it was fulfilled in the 70th week. To read a study that proves the covenant was from Jesus, click on Daniels 70th Week. Daniel 9:26-27 foretells the destruction of Jerusalem and the temple. There is no mention anywhere in the Bible of an Antichrist making a peace agreement with Israel or destroying the temple and Jerusalem. But history confirms that the people of Prince Titus, the Roman army, did in fact surround the city as Jesus warned in Luke 21, and they laid the city and temple desolate. To say that the 70th week of Daniel has not been fulfilled, is implying that God did not follow through on His promise to desolate the Jews and their temple, if they did not accept their promised Messiah. Jesus said in His Parable of the Wicked Vinedressers in Matthew 21, that the wicked tenants who killed the landowners servants and His son, would be killed, and the land given to another to bear the fruit. Jesus said in His Parable of the Wedding Feast in Matthew 22, that God invited the Jews to be married to His Son Jesus, if they would accept His offer of salvation. But they refused and they killed His servants. And when the king heard about it, he was furious. And he sent out his armies, destroyed those murderers, and burned up their city. Those parables aren’t just stories, they were prophecies to the Jews, that they would be killed if they rejected Him as Messiah. In Matthew 24, Jesus described the Great Tribulation that would take place when the Roman army surrounds the city. Historians confirm that there was famine, and pestilences, and wars, and false prophets who told the Jews it would be okay. Jesus told the disciples that when they see the Abomination of Desolation, which Luke 21 tells us is the army surrounding the Holy Place of Jerusalem, then they were to flee to the mountains. 1.1 Million Jews died from starvation, from disease, from infighting, from crucifixions, and by the Roman sword. There are no recorded deaths of any of Christians, people from the House of Israel and House of Judah who accepted Jesus as Messiah, as they saw the sign and fled the city with God’s protection. To say that the 70th week of Daniel has not been fulfilled, is to remove the finality of the desolation of the Jewish nation. To remove Jesus ministry from the 70th week is to remove the precise timing that proved that Jesus is the Messiah. 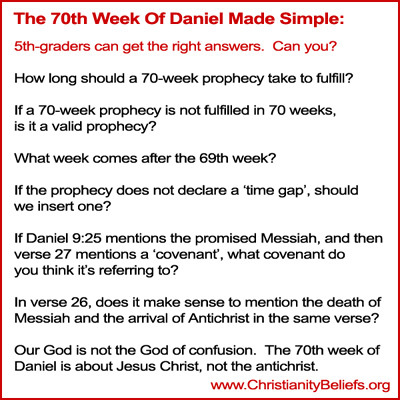 Here are some graphics to use on Facebook and other social media sites, to help people see the truth about the 70th week of Daniel. Very interesting article and a new teaching to me. But I’ve learned over the past few years that a lot of what I was taught in church was plain wrong. Anyhow, if you are correct how would the end times scenario be? Would it be different than most Christians have been taught? Lora, the concept of a future 70th week of Daniel, the supposed 7-year tribulation period, is the foundation of the enemy’s deception; so by proving that it is false, their whole narrative falls apart. May our Holy Father bless you in your search for truth! The only part I disagree with is the centrality of the Pope. Catholicism is, of course, a harlot religion (paganism masked as Christianity), but Revelation pointedly warns us of the synagogue of satan. Today’s word elite are the Zionists, and I believe that the mother of harlots refers to the Talmudic teachings of the Pharisees. We are now in the end game. I tjink that throughout history, Lucifer has used the Zionsist and the NWO beast to attain his goal. But now the 10 kings (NWO, UN) are battling with the Zionists for control of the world. Personally, I am certain that the 10 kings are going to destroy Israel. All of Revelation points to Rome; to the Roman Emperors who killed millions of saints; to the antichrist Roman Popes who banned and burned the Scriptures, and caused over 50 million saints; to the false prophet Jesuits General, the Black Pope, who controls the Vatican and antichrist White Pope. The ‘great city’ of John’s day was Rome, not Jerusalem. John was pointing to Rome. The false prophet Jesuit General and antichrist Pope control Zionist Israel and Jews through the Rothschild family; using them to control the Middle East; and to steal the wealth of nations. What about the two witnesses, who’s ministry is for 3 and a half years? Here is the explanation of that verse. Be sure to read the whole study about the earth beast of Revelation 13, to get the whole context. They will incite WW III between Muslim countries (the kings of the east) and Israel; and will no doubt cause a worldwide financial collapse. This will make everyone desperate for solutions. The Jesuits will have the Pope act as a savior, proclaiming that they have been preparing for these events (since they caused them) and that they can prevent future religious wars; and that they can help people buy and sell again, so that they can get water and food; if people will join with them in their One World Government. The world, including many Christians, will revere (mark on forehead) and obey (mark of right hand, actions) the Pope; as they deem him as a savior, who offers peace and safety. A RF-ID chip or tattoo could be used to track who is part of the One World Government, but it is not the mark of the beast, it is the result of revering and obeying the antichrist beast Pope of Rome. Hello! Thanks for the study. I’ve been drawn to this for quite some time and definitely lean toward the side of it being fulfilled. If the sacrifices have already been cut off then why imagine that the verse applies to it happening a second time? It makes no sense. I do have a question and this troubles me every time. 11: “From the time that the daily sacrifice is abolished and the abomination that causes desolation is set up, there will be 1,290 days. 12: Blessed is the one who waits for and reaches the end of the 1,335 days. If the daily sacrifice being abolished is Jesus dying on the cross, and the abomination that causes desolation is to be the roman army conquering Jerusalem. Then why does it give a 1,290 day gap in between those two events. It’s puzzling to me. Thanks! Hello Christian! When Messiah died in the middle of the 70th week of Daniel, He ended the need for temple sacrifices. But that does not mean that the Jews stopped making them. The Jewish leaders did not believe that He was their promised Messiah, so they continued sacrifices until 70 A.D.
Daniel 12 is saying that from the time of the appearance of the Abomination of Desolation, which happened in 66 A.D.; until the time that the sacrifices are stopped, which happened in 70 A.D.; there would be 1,290 days.